Helps treating arthritis relieving joints pain & have analgesic properties. 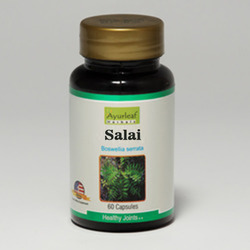 Shallaki Capsules is a plant that produces shallaki and in Latin is known as Olibanum Indicum. The herb is native to much of India. In Ayurvedic medicine Shallaki has been used for hundreds of years for treatment of arthritis. - Latin Name : Boswellia serrata Roxb. Shallaki is beneficial in chronic inflammatory conditions. Commonly known as salai guggul, shallaki reduces joint pain and swelling aand increases mobility. It is absolutely safe in long term therapy and does not show any gastrointestinal side effects. - Joint pain and inflammation due to osteoarthritis. - Chronic back and muscular pain. - Joint pain after menopause. 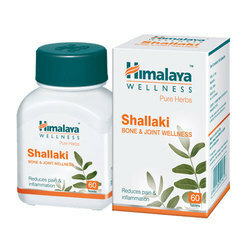 - Shallaki provides gentle care for joints. - A Safe herb that has excellent anti inflammatory & analgesic properties useful in treating arthritis and helpful in relieving joint pain.